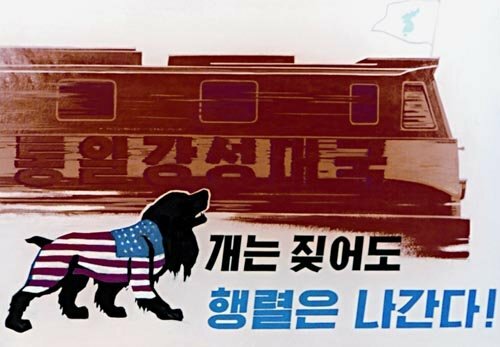 Translation of North Korean propaganda poster: "Though the dog barks the procession moves on!" When Kim Jong-il died 10 days ago, I realized just how little I knew about North Korea. My mental file on the country was pretty thin. Most of it centered around movies I've seen featuring either fictional or documentary portraits, both released in 2004: the puppets in Team America: World Police and the dancers in A State of Mind. The former being Matt Stone and Trey Parker's action-comedy parody and the latter a frightening look at the children who train for years to participate in the country's Mass Games. Well, that and that one George W. Bush State of the Union speech from January 2002. And that was pretty much it. That means that up until very recently I received around 2/3 of my mental picture of the single-party state from the South Park guys and Dubya. Not an enviable position for your average intellectual. So, in an effort to further my continual goal of perpetual education, I turned to the one source I always turn to without shame to broaden my horizons: Wikipedia. I've always enjoyed Wikipedia, even if I've never fully trusted it. It can't be used as a source or reference in and of itself, but I have always found it to be one of the quicker ways to ascertain the general idea of any given subject. 5. After his death, Kim Il-sung was declared the country's Eternal President. Right out the gate I love this fact. I think there are some people in this country who would declare Washington or Lincoln or Kennedy or whoever Eternal President if they could. I also like how on the Wikipedia page for Kim Il-sung it says that he is the office holder and he is the incumbent, even though this position was taken away in the North Korean constitution meaning that it would take an amendment to have anyone ever succeed him; which they never will. 4. Kim Jong-il's official biography states he was born in a secret military camp on Baekdu Mountain in Japanese Korea on 16 February 1942. Official biographers claim that his birth at Baekdu Mountain was foretold by a swallow, and heralded by the appearance of a double rainbow across the sky over the mountain and a new star in the heavens. Whoa. "Cult of Personality" isn't just a rad Living Colour song, it's an all too real concept in North Korea. This whole mystical power provided to the royal bloodline as it were is pretty interesting. I say interesting because I don't have to live there and pretend like I think it's a great idea. 3. There is even widespread belief that Kim Il-sung "created the world", and Kim Jong-il could "control the weather". It's as though in the absence of religion, a state religion has to take it's place. The need for mass control on this level still exists for totalitarian governments, it just takes a different form. There still has to be a willing populace to grant credence to this, though. 2. 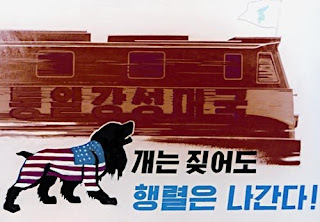 Reporters without Borders ranked freedom of the press in North Korea as 177th out of 178, above only that of Eritrea. I don't know what they're doing in Eritrea, but they've got to be screwing things up pretty to fall behind North Korea in this category. When I lived in England I was staggered by the amount of tabloid tactics in even general-issue newspapers. At least they never deified Tony Blair. On second thought, maybe Eritrea and North Korea are just worse at hiding it than other countries. 1. (Kim Jong-un's) eldest half-brother, Kim Jong-nam, had been the favourite to succeed, but reportedly fell out of favour after 2001, when he was caught attempting to enter Japan on a fake passport to visit Tokyo Disneyland. This one kills me. Of all the things to get taken down for, it had to be this. I can just picture him with his mouse ears on his head and Disney Dollars in his hand being led back to the helicopter. Ironically, the official motto of Tokyo Disneyland is: "Where Dreams Come True". Except for you, Kim Jong-nam, except for you.